The development and use of genetically modified organisms (GMOs) has been a contentious topic for the last three decades. While there have been a number of social science analyses of the issues, this is the first book to assess the role of Non-Governmental Organizations (NGOs) in the debate at such a wide geographic scale. 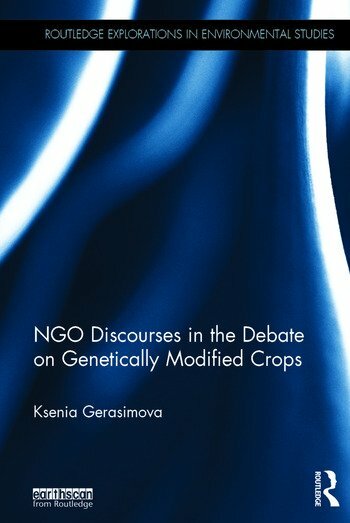 The various positions, for and against GMOs, particularly with regard to transgenic crops, articulated by NGOs in the debate are dissected, classified and juxtaposed to corresponding campaigns. These are discussed in the context of key conceptual paradigms, including nature fundamentalism and the organic movement, post-colonialism, food sovereignty, anti-globalisation, sustainability and feminism. The book also analyses how NGOs interpret the debate and the persuasive communication tactics they use. This provides greater understanding of the complexity of negotiations in the debate and explains its specific features such as its global scope and difficulty in finding compromises. The author assesses the long-term interests of various participants and changes in perceptions of science and in public communication as a result. Examples of major NGOs such as Greenpeace, Oxfam and WWF are included, but the author also provides new research into the role of NGOs in Russia. Ksenia Gerasimova is a research associate and affiliated lecturer in the Centre of Development Studies, University of Cambridge and a research fellow in the Centre of Environment, Energy and Natural Resource Management, University of Cambridge, UK. She is also Professor of Public Policy at the Higher School of Economics University, Moscow, Russia.